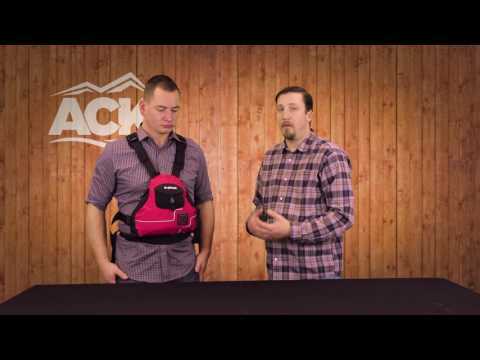 The NRS Ninja PFD Life Jacket - PFD is a low-profile life jacket. The NRS Ninja PFD is perfect for kayakers and boaters with short torsos. It's a compact design that won't interfere with paddling, rowing and swimming. A side entry, with two quick release buckles, is secure and easy to put on and take off. Check Fit Guide tab for proper sizing. Comfortable and compact with great range of motion! Great fit, very comfortable to wear!! 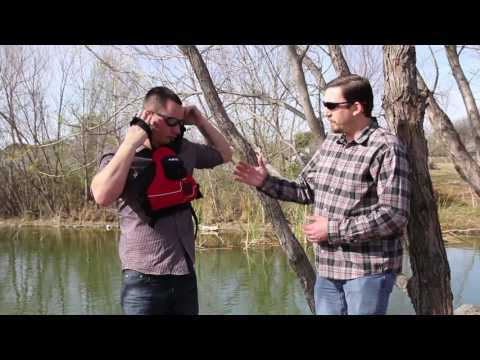 NRS Ninja PFD Life Jacket - PFD: I like it. Yeah, it is just a little bit bulky in front, but it's cut well for plenty of unrestricted arm movement for paddling. As for the "little bit of bulk", I'm an ex-Coast Guards man, and I understand the need for good floatation. So...I like "a bit bulky" a lot!. I know I can easily stay afloat until I figure out how to get back into the 'yak while in deep water. I really like his PFD. It doesn't have a lot of bells and whistle, but it get the job done. Very compact, not hard to paddle with in rapids, and keeps ya afloat when you swim. The front pocket holds my Garmin Dakota GPS perfectly (and absolutely NOTHING else will fit in it once the GPS is in there). I use the hand warmer section of the Ninja to hold my folding knife. It fits in there nice and snug. I haven't noticed this jacket ride up at all. Nice life jacket. My only complaint is that of all the items that I purchased with my kayak this is the only one that was not made in the US. So minus one star for being made in China. Great jacket!!! You can't go wrong with this one if you want a jacket that does not get in the way. Due to it's small profile it is a little thicker than a full jacket but still unobtrusive. If you are not a swimmer and you need maximum floatation this may not be your best choice. I wish I had bought it as my first a long time ago. Bare bones, light, ergonomic with a great fit that's easily adjustable. Recommended for any Kayaker. Construction is top notch. Well worth a few extra dollars over cheaper models. Small front pocket has a key lanyard. Went down the Gauley recently in West vVirginia, most rafting guides use NRS PFDs. Awesome fit. I am a size 40 chest and wore the size s/m vest over a spray skirt and wet suit with very little straps to pull. None restictive and good range of movement in class III and IV rapids. If you are concernd about bouyancy and the compact size, this vest will keep you up! If your a serious kayaker forget the jackets with fancy pockets unless your going on a fishing trip. You will look like a pro in this vest. Good fit, great floation and is short enough not to interfer with skirt on my kayak. The Ninja PFD is great. I use it for kayaking and SUP. It is comfortable and minimalist for a PFD. Highly recommend it. Great fit and comfort. Light weight and well built. Used it for the 1st time today, very nice PFD!! Very comfortable!! Great product, great price, fast shipping! Thanks ACK & NRS! I have several other high end PFDs designed with kayaking in mind. All four restrict me in some manner when paddling any of my sea kayaks with a spray skit deployed. The Ninja has solved all my problems. It does not interfere with the back of my cockpits therefore riding up and causing discomfort on long outings. Once underway it is almost forgotten. It does not restrict my movement and is fully adjustable. Great for paddling. Fits well for dragonboating. Free range of motion. Fits well and gives a great, unobstructed range of motion. It works well for dragonboating. This is a great paddling PFD. I'm a petite woman and I was looking for a slimmer PFD option than the Stolquist Brick PFD. I use this for dragonboating and the shape allows for a good lean when paddling without your vest catching on the gunnel. I bought the size SM men's and it fits a 5'-0" to 5'-4" woman or a really skinny guy who is 5'-7". Fits like a glove.. Adjusts well. I would recommend doing the final adjustment in a sitting postion as this would mimic its usage. I first adjusted while standing then sat down and it was too tight..
Love this vest. Be the envy of your friends! Great fitting, my first thought was it might ride up with movement, but after a dozen kayaking trips and several raft trips it was never an issue. Highly recommended. Lightweight, easy to move in and easy to get in/out of. Nice PFD. This jacket is flexible and light. Awesome product. I wish it had a larger pocket on the front though. Great flexibility and adjustment with no more chafing. Highly recommended. I absolutely Love this vest, it is so much more comfortable than the traditional Style PFD. The pocket on the front is perfect for warming your hands on a chilly day.